First, let me tell you that I'm not a big fan of live albums. I only have two in my collection and those are gifts! I can't find a point in buying a live album just to listen to the songs in their studio version, performed live by a band, with overdubs mastered, producing like another studio album and listening to the crowd between the tracks. But MY DYING BRIDE's An Ode To An Woe is getting away with it. And that's because the songs are not exactly the same with the album version. Apart from that you may find one or two mistakes and some microphonics, which makes the album sounds live enough. The album kicks off with a reasonable choice. To Remain Tombless is the first track, full of energy that gives the pace for the next songs that follows. My Hope, The Destroyer is next. The drums are quite high in the mix, and Aaron's voice is a little back, a thing that is nice in a live album. It gives you the impression that they didn't do lots of changes. For You is next in line, where you can listen to some nice keyboards that gives a plus to the song. The Blue Lotus follows and it's the right moment for the introduction of the new members. Like Gods Of The Sun takes us back again in the old days, one of my favorite songs, followed by another great composition, Catherine Blake. A short version of The Cry of Mankind is next, where you will listen to some mistakes, but it is a live album, isn't it? But it's time for an awkward, for many fans, selection, but one of my beloved songs. The Whore, The Cook & Her Mother. A great surprise for me, since I believe that 34.788% Complete is a masterpiece and this song is one of the best in this album. The next one is one of the two songs from the new material. 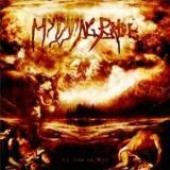 Thy Raven Wings, in my humble opinion, is not one of the best compositions of MY DYING BRIDE, but the applauses in the beginning of the track, are showing that the crowd likes this one. Two oldies are next. The really old one, The Snow In My Hand, and She Is The Dark. Two songs that make us think why this band is one of the best Doom Metal bands on the planet. The last track, The Dreadful Hours, is the best way to close their appearance, with a slow 'doom' composition. If you have seen this band performing live in a close live arena, you can imagine the dark atmosphere that is present. As I stated in the prologue, I'm not a fan of live albums. But this one is as good as a live album can be. Some fans may dislike the set list, but I think that's not bad at all. If you like MY DYING BRIDE, like I do, you will like this album. If you don't know much about those British, well this album is a start, but you'd better run and buy all their albums immediately.